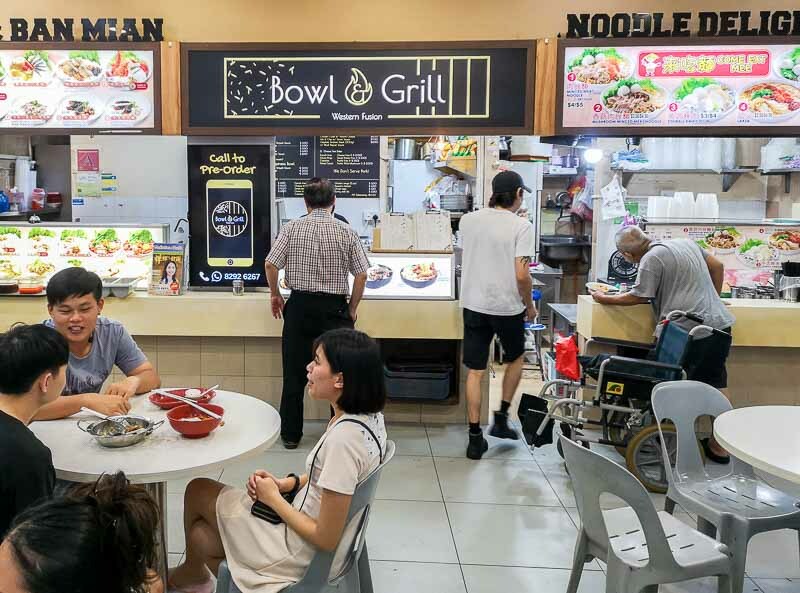 Wedged between Punggol and Sengkang, you’ll find a western stall in Block 267 along Compassvale Link called Bowl & Grill that lets you build your own bowls. 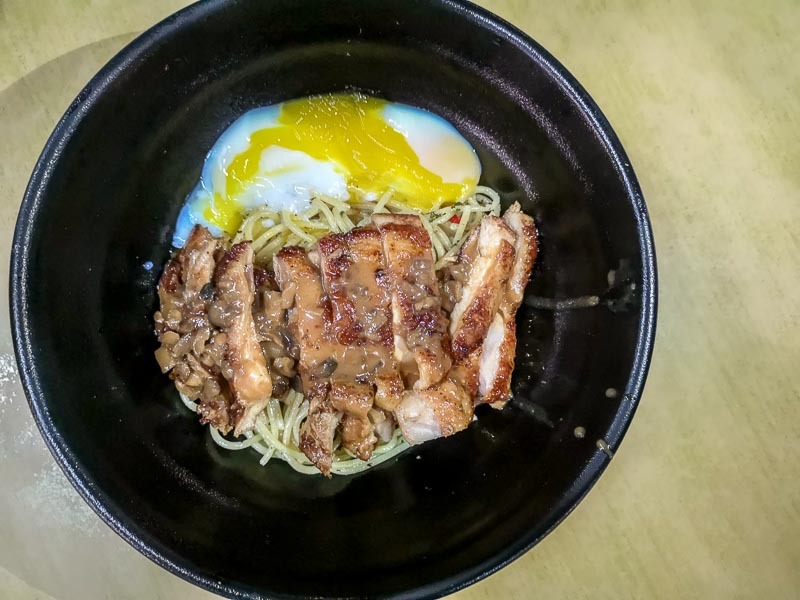 Apart from choosing your choice of base — mixed salad, short grain rice, teriyaki soba (additional S$1) or aglio olio spaghetti (additional S$1.50), you also get to choose which main tickles your fancy. 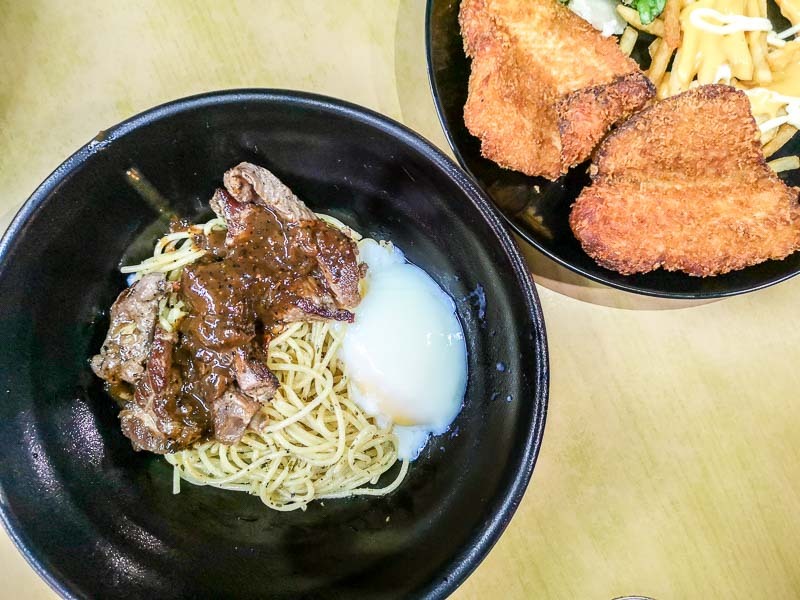 One of the simpler combinations we tried was Teppanyaki Steak With Black Pepper Sauce (S$8.90) with a base of aglio olio spaghetti. I love that all the bowls here come with an onsen egg! The steak itself was adequately tender, with sufficient pepperiness to satisfy my palate, while the aglio olio lacked flavour. It was rather bland and had no trace of chilli or garlic, and one of us had to head back to the stall to ask for cut chilli. 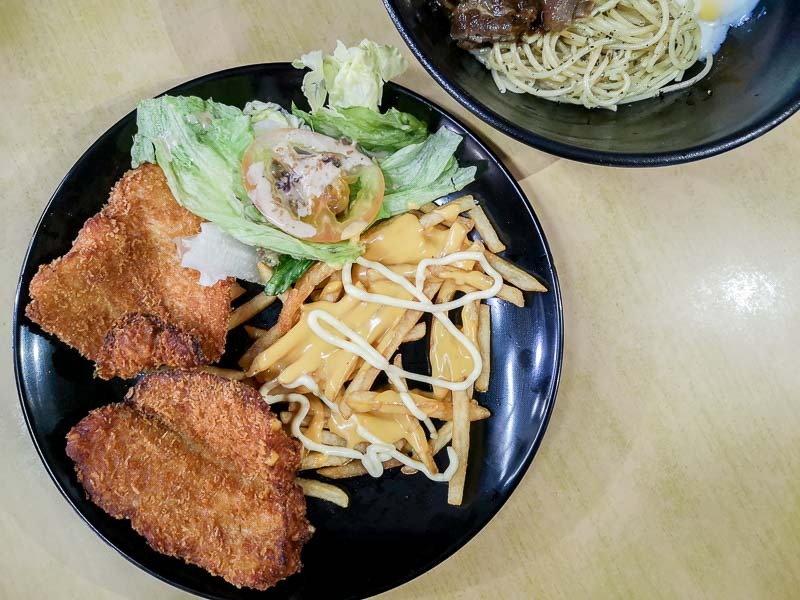 We also gave the Chicken Chop With Mushroom Sauce (S$5.50) a shot, paired again with aglio olio spaghetti. We felt that the chicken itself was underseasoned, having the mushroom sauce do all the work to give the entire bowl some much-needed flavour. So far, our impression of the food was lacklustre, only to be merely appeased by the numerous combinations and the portion size. 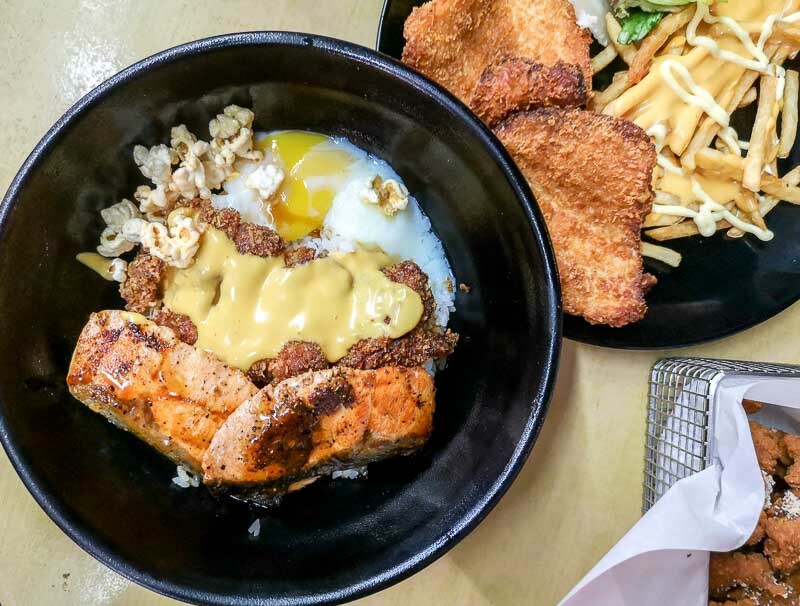 A heavier bowl we designed was with Grilled Salmon With Teriyaki Sauce (S$6.90) and Chicken Cutlet With Nacho Cheese (an additional S$2), and short grain rice as the base. We were surprised to see a sprinkling of popcorn in our bowl, and we assumed that it only comes when one orders double the protein. The salmon leaned towards the dry side, making us rely too much on the nacho cheese for moisture — which should never be the case, in any situation. Thank God for the viscous onsen egg that brought the dish together somewhat, because, without a trace of sauce or liquid, it would have proven to be an arduous task of even calling this bowl decent. 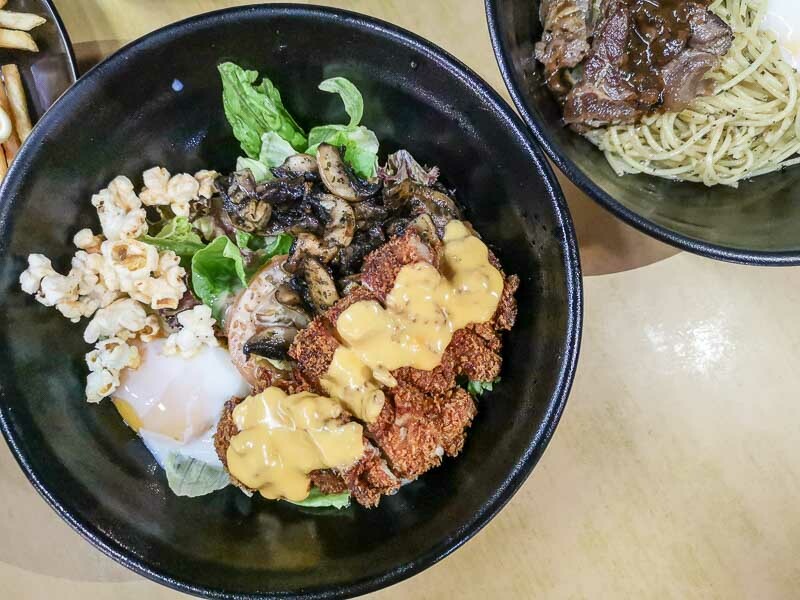 At an attempt to try a bowl that’s less carb-heavy, we chose to make one with mixed salad as a base and throw in Chicken Cutlet With Nacho Cheese, with the addition of Wild Truffle Mushrooms (S$2). It was no surprise that the familiar aroma of truffle permeated the air around the table, but what we wanted to find out was whether making a salad out of this combination would satiate us. Indeed it did, mainly because we ordered sides as well. But I would imagine consuming this on its own would warrant a follow-up meal within the next three hours. 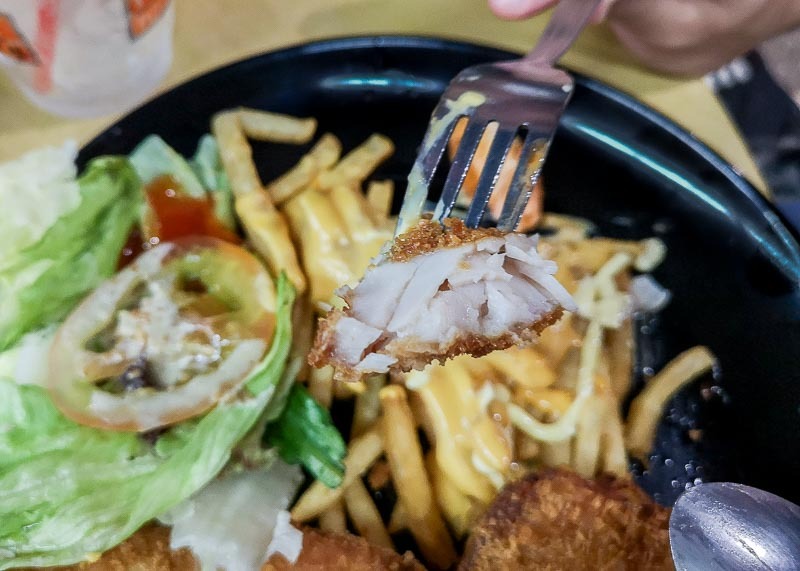 We also ordered the Fish & Chip With Tartare Sauce (S$7) simply to throw some variety into our meal, and also to give one of the classic options from their ‘Happiness Grill’ menu section a whirl. I was glad to see the portion of the fried fish taking up almost half of the plate. The fish was flaky and the flesh subtly sweet. For a price like that, it’s quite acceptable, and had no real complaints about it. For sides, the first we ordered was Cheese Takoyaki (S$4.50). 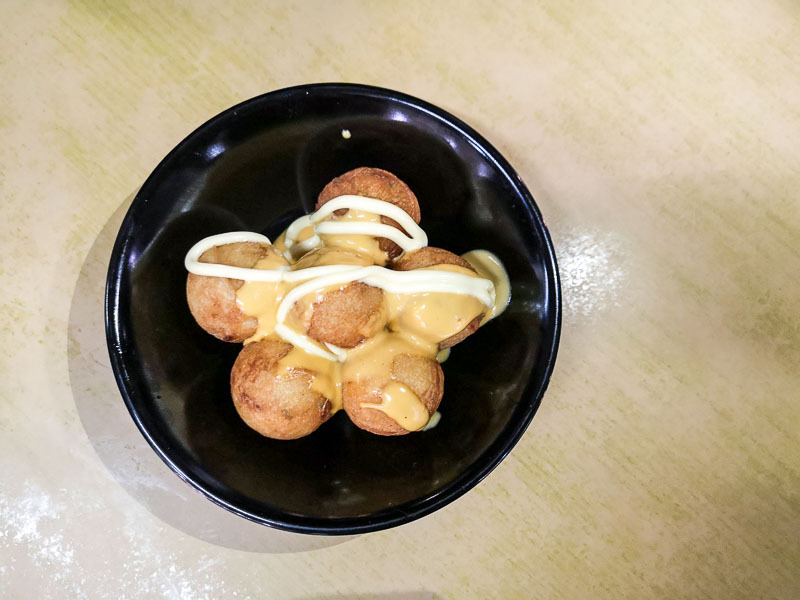 I initially thought I was going to find oozy gooey cheese inside the takoyaki, but instead, empty balls of airy dough, drizzled with nacho cheese and mayonnaise greeted me with much disappointment. Safe to say, it was a waste of almost S$5, and I would advise you not to make the same mistake as I did. 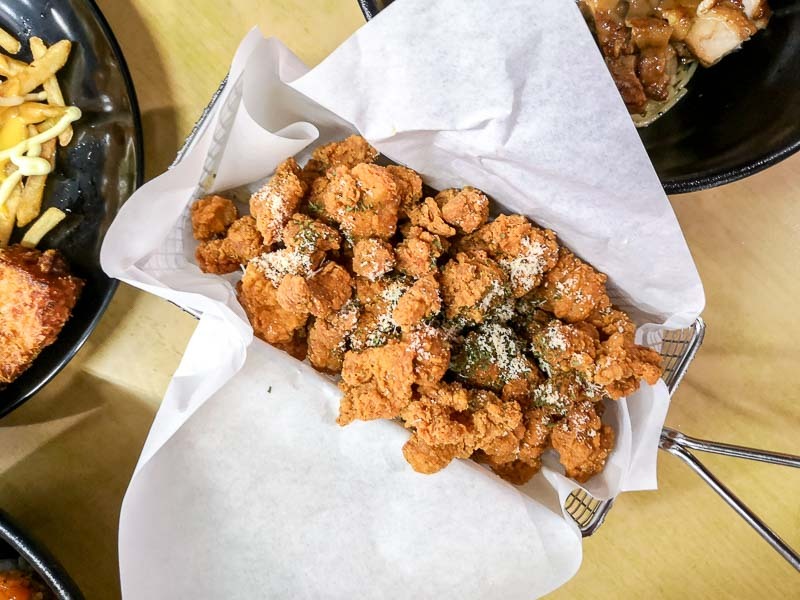 I love popcorn chicken as much as the other person, so when I saw that they have Truffle Popcorn Chicken (S$6), it piqued my interest. I was thrilled to see a mountainous portion served, but that enthusiasm quickly fizzled when I barely tasted any trace of truffle oil. To be fair, it was still reasonably addictive, because, hey, it’s literally fried chicken pops. But to claim that it’s cooked with truffle oil and have none of it detectable was a huge letdown. As this place came to my knowledge via a recommendation, I had hoped and wanted it to — if not knock my socks off — at least leave a positive impression on me. It has the potential to stand out from other run-of-the-mill neighbourhood Western stalls, but its novelty only goes as far as creativity. The food itself needs to be better, bolder and more exciting. But to be fair, I’m sure there are those who live in the area who are more than happy to have customisable bowls that are very kind on their wallets. For that, I give them credit.